As pilots, we know the importance of good aircraft maintenance. As the person writing the check, we know a good value when we find one. Lakeshore Aviation is proud to have Jeremy Trousil as Director of Maintenance! 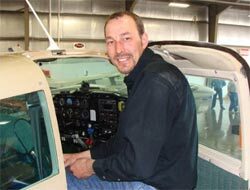 Jeremy has an extensive background in piston single and twin engine aircraft, and has a reputation as one of the best mechanics in northeastern Wisconsin. He's quick, efficient and fair. Email Jeremy with your maintenance needs. "He's probably the best mechanic I've ever worked with!" "Efficient on routine repairs. Brilliant on those tough ones." "What a great guy! Came out on a weekend when we broke down, and had us back in the air in record time." Lakeshore Aviation is proud to offer high quality, professional maintenance for single-engine and light multi-engine piston powered aircraft. We have years of experience with Cessna, Piper, Mooney and other typical General Aviation aircraft, as well as Lycoming and Continental engines. Pitot Static / IFR / Transponder checks and basic avionics maintenance available, too!